The DA-3000 is perfectly designed for stereo PCM/DSD recordings at high sampling frequencies suitable for archival masters. This class-leading unit is capable of recording analogue and digital signals up to 192kHz PCM or 5.6MHz DSD. 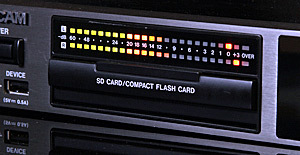 The unit records to both SDHC cards and UDMA supported CF cards. 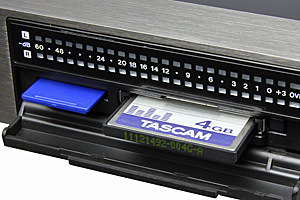 For maximum ease-of-use Tascam designed the front panel with all of the necessary external controls including long, brightly lit meters and display. The 128x64 OEL display allows you to check information quickly, and the 24-dot level meters allows you to confidently monitor levels at all times. Designed as the successor to Tascam's well-known DV-RA1000HD – a high-resolution PCM/DSD master recorder introduced in 2006 that used a hard disk or DVD media for audio recording – the DA-3000 is Tascam's new flagship for high-definition audio recording and AD/DA conversion. The sleek, modern DA-3000 fits in any recording studio, professional or home, for recording, mastering, broadcast, and for audiophiles wanting to take the next step to perfection. It records to highly reliable solid-state SDHC or CompactFlash media, offers widely respected Burr-Brown converters and sophisticated preamplifiers built from selected components for outstanding sound quality. And its zero-noise design means no cooling fans or other mechanical noise sources as well as improved operational reliability and freedom of maintenance. The unit supports high sampling rates up to PCM 192 kHz and DSD 5.6 MHz. High-precision Temperature Compensated Crystal Oscillators (TCXO) and dual monaural converters for each channel ensure pristine audio quality with sample accuracy at both recording and playback. Multiple DA-3000 units can be linked easily for simultaneous multi-channel/multi-track recording and a host of connectors is available on the rear panel to fit the unit in virtually any environment. There are also large, bright LED level meters and an OLED display to provide wide viewing angle and high visibility even under poor lighting conditions. 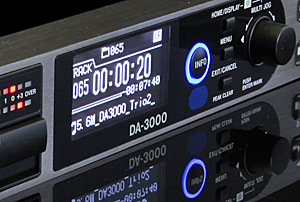 The DA-3000 comes with a wireless remote control and the ability to connect a computer keyboard for easy titling and control. THIS RECORDER DOES NOT COME WITH COMPACT FLASH (CF-UDMA) OR SD (SDHC) CARDS - PLEASE SEE OUR APPROVED CARDS BELOW.